Board meeting news: The WAVE Governing Board appreciates the recent actions of our Arizona Legislature to increase education funding. While this is a step in the right direction, it shouldn't stop there. The Governing Board supports continued conversations between educational leaders and legislators to find a sustainable educational funding source. Restoring previous funding cuts and properly funding education will protect and support our students and teachers and move the State of Arizona in a positive direction for years to come! 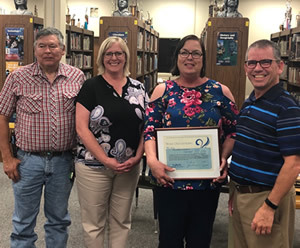 The April WOW Award was presented to Anne Holt from Parker Unified School District in recognition of her hard work and commitment to the Career and Technical Education programs at Parker High School. Anne is always available to help the CTE Director and teachers when they have questions. She prepares reports and financial documents to help with the CTE grants and pass through payments from WAVE. Mrs. Holt has also been vital in helping train the CTE Director on the school procurement system. Thank you for being a valued member of the PHS and WAVE CTE family! We appreciate your hard work, dedication and support! 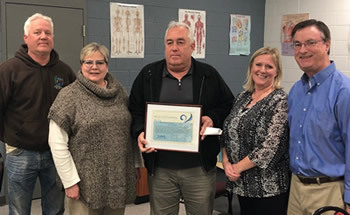 Joe Dorner from Lee Williams High School was recognized with the WAVE Outstanding Work (WOW) Award for the month of February. Mr. Dorner was instrumental in starting the Fire Service program at LWHS. 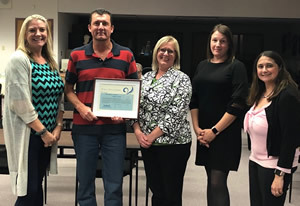 He has immersed himself in becoming an educator by attending training, participating in state curriculum writing and working with business and industry to get equipment donated. The most recent donation was a fire truck from the City of Kingman! And, his students participate in the SkillsUSA CTSO competitions. Mr. Dorner knows what it takes to be successful in this profession and is now helping students work towards this career option. Thank you for your dedication and support to LWHS, WAVE and CTE! The January WAVE Outstanding Work (WOW) Award was presented to Robert Keirns, Lake Havasu's Transportation Supervisor. Mr. Keirns and his team were recognized for their continued efforts to schedule, maintain and safely transport students on the WAVE bus. The transportation department is readily available, open to new ideas and always works to find solutions to obstacles. They are a pleasure to work with and are valued members of the LHHS and WAVE CTE family!